As most of my loyal readership knows, left to my own devices with covers, I’m like a hobo in a big box liquor store with a fifty dollar bill. Except slightly better dressed and groomed. Most of the time. Unless I’m hungover. But that’s a whole ‘nother story. 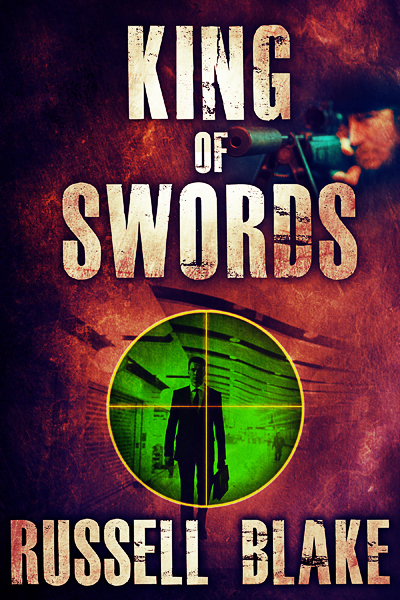 And so it should come as no surprise that I’ve been tweaking the covers for the Assassin series. 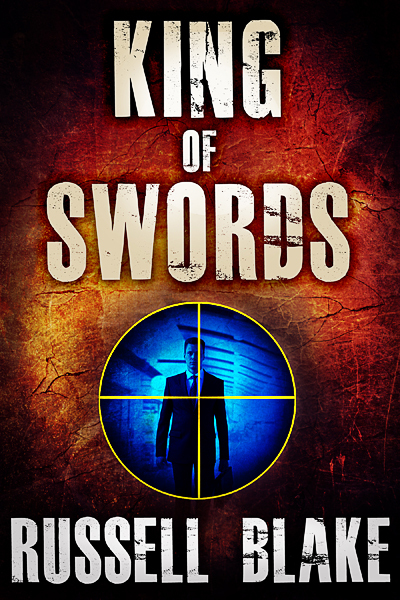 The first in that epic saga, King of Swords, is not only free for a limited time, but also has gotten a makeover. I messed with a lot of images on this one, including sticking a sniper in various quadrants, but in the end went with the simplest design, because it’s the most striking. I’ll post the also ran as well just so you can see where I was going with it. Why am I fixing what ain’t broke? Because I want a more refined look for the series by the time we move into the Fall selling season. It’s not that I didn’t like the old covers, because I really did. It’s just that I like this approach better. Looks higher tech. More visually interesting. And most importantly, these new covers really stand out when seen on Amazon next to similar books in the genre. And that’s the main thing. We’re in a retail world, and in retail, it’s visual appeal on the shelf that gets the reader’s interest. You have to grab em in the first two seconds and convey genre, mood, level of sophistication, etc. or they flip right past you. To stop the reader, you need curb appeal. And I think the new covers have that. Again, the goal was clean, simple, and direct. Now, never mind that the sniper looks a little like a scarface Chuck Norris (is that just me?) I can work with that. I just felt, in the end, that the cover was trying to convey too much in a glance, and was too busy. Maybe I’m wrong. I can always switch them if my first choice falls flat. So what’s next? All the rest of that series will get the same treatment over the next few weeks. Oh, and I’ve hired one of the top male cover models to do a set of shots for my new one, BLACK, which should release end of August, and which I’m HUGELY excited about. Not just because of how it’s written, which is sort of Elmore Leonard/Dashiel Hammet meets Geronimo Breach with more humor, although I’m pretty stoked about how it turned out. No, it’s because the concept for the cover is so damned cool. I have high hopes for this new series, and I’ve already written book 2 and am working on book 3. The plan is to have four in that series out by Xmas, and a new JET – JET VI. That’s aggressive, especially given the project I’m currently working on, but I think I can make it. Guess we’ll all find out. I was sitting around, staring at my navel, and decided that I wanted to give some of my backlist a facelift. Yes, tequila was involved. And what of it? Cast not the first, and all that. Anyway, I’m really happy with the new cover for Fatal Exchange I commissioned, so I thought it would be cool to give another favorite, Silver Justice, a new look. Nothing wrong with the old one, mind you. But I like to mix it up now and again. Because that’s just how I roll, Dawg. As readers of my work will know, Silver Justice is a Wall St conspiracy thriller set against the backdrop of the 2008 financial crisis, and it has serious implications for anyone interested in understanding just what happened, and why. It’s been a strong seller, and has garnered generally favorable reviews, except for readers for whom the financial stuff was not their cup of tea. Why those readers chose to buy a Wall St thriller is beyond me, but so is Bieber’s popularity, so what do I know? And yes, I understand that was a gratuitous slam, largely to attract the web crawlers looking for mentions of celebrities, which is why I’ll also include the Kardashians in this blog. But I digress. I think what I’m really trying to say here is that I rather like the new direction the covers are going in, which have a grittier, more immediate feel, which reflects more accurately their tone. Although I want it noted that I love puppies, ponies and kitty cats, which should boost my popularity with a certain segment through the roof – at least that’s my hope. Without further ado, here’s the new cover for Silver Justice, which everyone should go buy and read immediately, or you’ll suffer from non-specific back pain and become addicted to Vicodin and hillbilly heroin and wind up living in a shack eating from Taco Bell dumpsters while in constant danger of being boogarized by clowns as your highschool sweetheart laughs and mocks you and your parents point and shake their heads in disgust because you disappointed them yet again, as you have so many times before, which is why they wish you dead, as do your numerous enemies, who will do a victory dance on your cold unmarked grave whilst urinating upon it. Don’t let that happen to you. It doesn’t have to. Just buy the frigging book, you cheapskate. Don’t tempt fate.